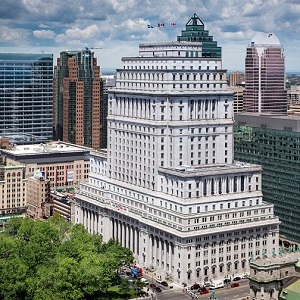 It’s 100 years old, but the Sun Life Building in Montreal could easily survive another century in excellent condition if investments continue to be made in its upkeep, its property manager says. The Sun Life Building was recently awarded the first BOMA BEST Platinum Certification for a centennial building in North America. The award is given to buildings for outstanding environmental performance and management. It was also named 2017 Building of the Year in the Historic Building Category at the BOMA Canada National Awards. Constructed in a neoclassic style between 1914 and 1933, the 26-storey Sun Life Building is about 400 feet tall and has more than one million square feet of space. The building was constructed in three stages, with the main tower the last section to be completed. When it was completed, it had the most space of any office building in the British Commonwealth. The Sun Life Building is owned by Sun Life Financial and a consortium led by Groupe Petra. It is managed by Bentall Kennedy, a Sun Life Investment Management company. Operating an older building at high standards of environmental performance is “an ongoing process. It’s not something you can pick up and do after one year or two years,” Zamestrieus says. That ongoing process includes reducing the building’s environmental footprint, wasting less water and electricity, and utilizing a data-driven approach to sustainability. “It’s beneficial for our clients, for our tenants, for the environment. It’s win-win for everybody,” he says. “To get buy-in from our tenants, constant reminders are sent to tenants about Bentall Kennedy’s ForeverGreen tenant engagement program that focuses on energy efficiency and reducing carbon emissions, waste diversion, water conservation and maintaining healthy work environments. The Metcalfe Street building was automated in 2008-’09 with improved lighting, security, access system and heat pumps for $1.1 million. Hydro Quebec subsidized $400,000 of the project cost. There are 1,600 heat pumps in the building and electronic thermostats maintain temperatures between 19-22 degrees Celsius year-round. Lighting is automated and a new phase of LED lighting is beginning. Carbon dioxide sensors are utilized to better manage fresh air intake. MERV (Minimum Efficiency Reporting Value) 13 air filters are now being used which are “a couple of notches above” industry standards. New motors run eight hours a day instead of 24 and at night-time, lighting sensors follow cleaning crews so unneeded lighting is not in use after hours. For the last seven or eight years, an average of $200,000 to $300,000 has been spent annually on sustainability projects. The building also has an EnergyStar score of 92 which is “extremely high” for an old building, Zamestrieus says. The Sun Life Building experience has been such a success similar systems are being put in place in the 150-year-old Le Windsor, a former hotel converted into offices during the 1980s. Bentall acquired that building in February. When he arrived at the class-A building in 2006, the vacancy rate was 15 or 16 per cent. It’s now at 7.5 per cent, which compares favourably to an overall downtown office space vacancy rate in the 10 to 12 per cent range. Major tenants Sun Life and National Bank have each leased about 30 per cent of the building, while Telus has 10 per cent. Res Publica (National Public Relations) and Public Works and Government Services Canada are among the other tenants. As part of its 100th anniversary celebrations, two beehives are being installed this summer on the building’s 11th-floor rooftop. The bees go off to Mount Royal and come back daily. Montreal urban beekeeping company Alvéole will manage the beehives and there will be visits planned for employees. Along with the beehives, urban agriculture firm MicroHabitat will be installing 30 pots of fruits and vegetables on the rooftop. Sun Life is also conducting a feasibility study about connecting the building underground to nearby Place Ville Marie, which would also connect the building to the city’s RESO underground network. The move was studied in 2001 but there was no follow-through. Zamestrieus says the tunnel would cost about $10 million and could open in the next five years. Awards like the BOMA Best Platinum Certification “overcome negative perceptions,” provide visibility and create “a good buzz” around Bentall Kennedy, he says. Among its other honours, the Sun Life Building won a heritage award in 2013, Building of the Year (TOBY) awards in 2011 and 2017, a TOBY customer service award in 2015 and is up for the International TOBY Award in June. Despite the building hitting the century mark, Sun Life is also seeking a WiredScore certification for high standards in online connectivity.